Hudson Poly Bag, as a custom poly bag manufacturer, extrudes, prints and converts antistatic LDPE and HDPE. We make both the standard pink antistatic bags as well as clear antistatic materials, depending on customer specification. We deliver on time, on spec and on price. We simply do what we say that we will do. There are three major classes of internal, migratory antistatic agents: esters, amines and amides. The esters are not widely used because the antistatic properties are typically of short duration. Amines can be used for non-electronic end uses, but they can react with polycarbonate, which is a typical component of printed circuit boards. Hudson Poly bag uses only amine-free amides to circumvent this issue. All three migratory agents utilize the same method of creating the antistatic properties, they migrate to the surface and absorb the humidity in the air. When this has been accomplished, it is not unusual to notice a slight slippery or greasy feeling on the polymeric material. There has to be a conditioning or bloom time for the surface of the material to become antistatic. Typically, for LDPE or LLDPE poly bags, this is two days. For polymer structures such as HDPE or PP poly bags, this takes considerably longer. Film that is wound under tension is also much slower, until it is unwound and can gain exposure to the humidity in the air. 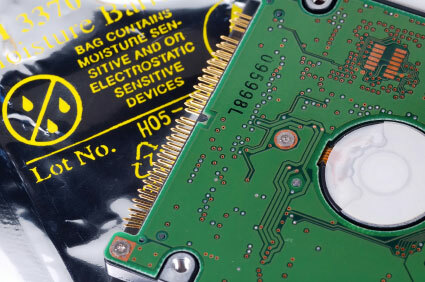 The antistatic properties are typically measured in two ways, decay rate and surface resistivity. The decay rate is a measure of the time required (seconds) to dissipate a certain fraction (90%) of an applied 5000 volts charge. Surface resistivity is the resistance of a product at its surface measured in ohms. A product is said to be antistatic if the surface resistivity is 109 (read 10 to the 9th power) to 1013 ohms. Hudson Poly Bag supplies antistatic materials with a decay rate of 0.5 seconds for 90% dissipation of 5000 volts at 50% relative humidity. Surface resistivity is supplied in the 1010 (read 10 to the 10th power) to 1011 ohms range. In order to print any olefin material (LDPE, HDPE, or PP), the surface must be oxidized in order for the ink to adhere to the surface of the film. The two methods of doing this are corona treatment or flame treating. Due to safety issues and practicality, flame treating is almost never used. Unfortunately, when corona treating film, this accelerates the migration of the antistatic agents to the surface. This means that the inks will not adhere as well as they would to a non-antistatic surface. It is important for the end customer to understand these issues if printed antistatic products are being considered.